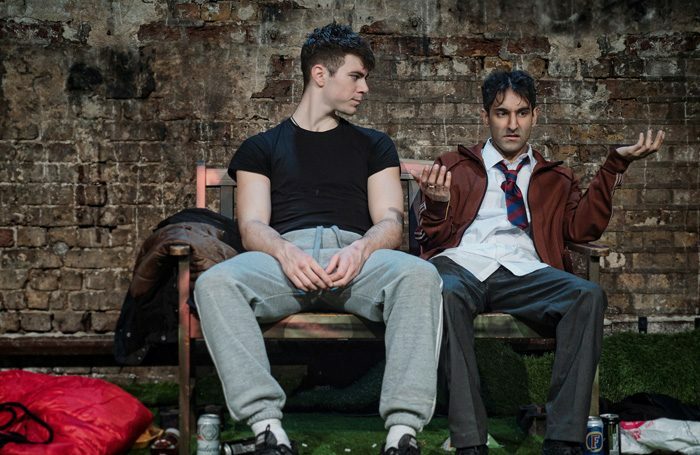 Conor Hunt’s Kings of Idle Land tells the touching, recognisable story of a pair of young gay men and, over an hour of sensitive but slightly mawkish dialogue, traces their separate struggles against the backdrop of the 2001 Oldham riots. It’s a world of Walkmans, Westlife, and racially-motivated violence. 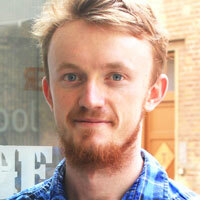 Michael is a broad-chested, big-hearted blokey type still keeping his sexuality a secret. Hammad is a more comfortable, more romantically experienced British-Pakistani, whose struggles are less to do with his being gay, and more to do with the colour of his skin. Over two half-hour scenes, taking place on a graffitied bench in a square of litter-strewn green grass, these two unlikely allies bond, at first jokily, then with increasing tenderness. Both characters are carefully drawn, and excellently portrayed by Samuel Retford and Shiv Rabheru. Retford captures both the transparent mix of bravura and denial that forms Michael’s outer shell, and the softer, shyer side underneath. Rabheru, meanwhile, neatly makes clear that while Hammad shares some of his friend’s insecurities, he has another battle that Michael cannot comprehend. Hunt’s direction is fun and fluid throughout, but while there is a likeable lacing of broad humour, and while the Oldham setting does add an original angle, Kings of Idle Land often feels derivative – delicate, but derivative, clearly owing a debt to films like Call Me By Your Name and God’s Own Country. A familiar play, then, notable for two deft performances from Retford and Rabheru.